We're thrilled to have Sasha Stephenson join us to share more about his debut novel ICELING. Sasha, what scene was really hard for you to write and why, and is that the one of which you are most proud? Or is there another scene you particularly love? The hardest thing to write from like a technical perspective was the big Arctic Showdown towards the end. I've never written a scene that big or with that much incessant action before, and to spread one scene out over a few chapters, to try to encompass this huge event ... it was a lot of work. In terms of the scenes I'm proudest of, one would have to be the end of chapter 11. Balancing Lorna's interior narrative with the actual description of the events unfolding in front of the car was real challenging, and plus I got to include some references to The Edge. Writing it felt like this tightrope act of conveying the genuine terror Lorna feels at this scene via the ways in which she was reacting to it, which was equal parts denial and bad jokes and cussing and panic, while at the same time needing to describe things from both inside and outside of her perspective, to let the reader see both what was happening and what she felt was happening, to blur them without losing track of her feelings or the situation itself, which was, quite rapidly, escalating way out of hand. But, for me, the scene I love the most is at the end of chapter 25. [I'm trying to talk about all of this without spoiling anything! It is not the easiest thing!] It was a big scene, for me, emotionally, to try to get myself to understand what Lorna would feel in that moment, and how she'd want to express it. The scene just came tumbling out at first, and then I had to wrench the rest of it out word by word. It felt very important to try to feel every single thing that Lorna would be feeling in that moment, and to render it as painfully and tenderly as possible. To watch someone's dreams die, and then to imagine what that would feel like, and then to look over, and to see what their eyes look like watching all this, and to realize that you maybe understood a fraction of that hurt... I remember it was real late at night, in December of 2014, and as soon as I finished that scene I went outside, and the air was freezing, and I was sort of just walking around, stunned and spent. How long did you work on ICELING? I think I spent 4 months cranking out the first draft, and then 2 months on the second draft, and 3 months on the third. With a few last minute edits thrown in. 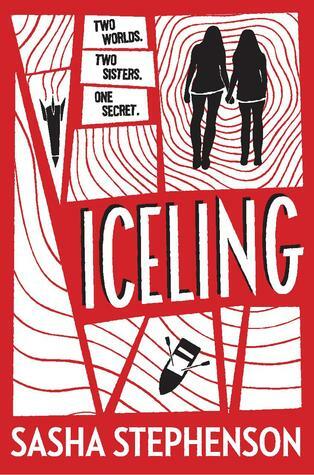 What do you hope readers will take away from ICELING? At first I wanted it to be viewed as like, an action-packed, vaguely feminist road trip where the reader comes to understand that the figures of authority may actually be attempting to look out for Lorna's interests, but it's their idea of her interests. Nobody sat down or talked to her, or asked her what mattered, they just decided what mattered, and acted on it. And this notion of knowing what's best, it can get weird, and dangerous, when you don't actually ask the people concerned what their concerns are. But now? Now I sort of feel like at its core it's about sisters. Whose lives, as they understand them, get shattered. Lorna spends the whole road trip recounting to herself what brought them there and how Callie's important to her, and so much of that is because she's trying to remind herself of what her life is as it falls apart around her. It's an attempt to hold on to her ideas of what things are. It's desperate. So at its core, it's about these two sisters. And one of them is, basically, an immigrant: she got rescued from a disaster and sheltered and raised by an American family. And, one day, the government decides that this group of immigrants might be a risk. Because they don't understand them, and they don't know what they're capable of. And so then, y'know, the books ends with a massively violent showdown, because of this. Also I hope they get all the jokes about the movie The Edge. I hope they come away feeling that it is real important to love somebody, and to examine what that means. I work at home, usually at a desktop, near a window, with music playing. I need to have something going in the background or I get too lost in my own head to actually get any work done. Plus then, and this was real helpful for the early parts of ICELING, I can put playlists together to try to invoke [or, if we're being honest, trick myself into] a feeling or emotion that can better guide the scene I'm working on. I try to keep my desk clear enough that I can have a mug of coffee and a glass of cold water nearby. I usually have a series of post-its strung up on the wall to try to map out the book and whatever scenes I'm working on. I think the biggest help to my writing process was the moment when I realized that the actual act of writing was maybe like 1/3 of what is actually involved in writing a book. The rest being editing it, and learning how to live with the people you're writing about. It's real hard to tell a story about imaginary people you haven't spent much time with. Callie is an Iceling—one of hundreds of teens who were discovered sixteen years ago on a remote Arctic island, all of them lacking the ability to speak or understand any known human language. Have you had a chance to read ICELING yet? Have you ever written a scene that's left you stunned and spent? Do you get too lost in you own head to actually get any work done? Share your thoughts about the interview in the comments!